You know we can't resist cat themed books. When I saw Square Cat on the shelf at the library last week, I just knew we had to read it. Isn't that orange square cat on the cover simply adorable? Turns out the cat's name is Eula. And she's not purr-fectly happy with her square shape. "Life wasn't easy for a square cat. Mouse holes were impossible. And when Eula tipped over, it was hard to get back up." Content cats purr. A square cat named Eula is not content with her shape and she's certainly not purring. Eula's unusual square shape presents many challenges like having to figure out a way to get back up when she tips over. She'd much rather be a round cat like her friends. Eula's friends, Maude and Patsy, try to help her feel round by giving her a make-over with hoop earrings and a roundish beehive hat. She ends up looking rather ridiculous, and she still suffers from tipping problems. Finally, her friends figure out that they can help Eula regain her purr by showing her the positive aspects of her square shape. 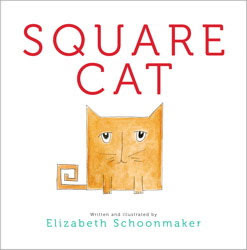 Of course one expects silliness in a book about a square cat. 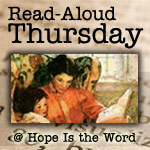 There is plenty of silliness in the book, from Eula's beehive hat to her donut eating binge. But, there's also a little deeper message, too -- a message about embracing your differences and being a true friend. Eula's friends go to great lengths to help her feel comfortable with her square shape. They even wear boxes because that's what good friends do. While the message in Square Cat is great, my kids like this book because of the unique main character. Eula certainly stands out from the crowd and grabs a child's attention. The four letter name "Eula" wonderfully fits the four-sided feline character. Plus, like Mo Willem's Cat the Cat, the simple, square-shaped Eula is easy for a child to draw. 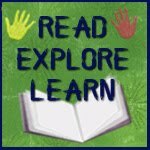 The book is a perfect choice for beginning readers. In fact, it is just about the right level of difficulty for my graduating kindergartner (though she does have some difficulty with Eula's name). The ending isn't as strong as I had hoped, but Eula still won over our cat-lover hearts. In the illustrations, Eula looks flat as a pancake. This portrayal works in the illustration world, but we couldn't help but wonder what Eula would look like in real life...in 3D. 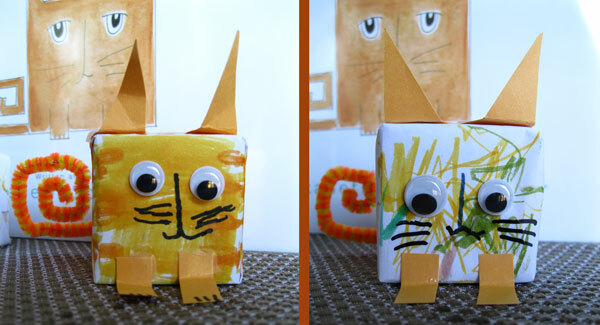 For the story + art project today, my kids made their own 3D square cats (a.k.a. cube cats). I wrapped a couple of alphabet blocks in white printer paper so the kids could start with a blank cube. They used markers to color the paper and designed their own square cats. After they finished coloring, they added google eyes, paper ears and feet and a square-spiral pipe cleaner tail. This is a great play art activity. When the kids finished creating their square cats, they spent some time playing with their creations. They even stacked their square cats, just like in the book. If they decide they want to change the look of one of their cats, we can easily take off wrapping, recycle the paper and start all over with a clean slate. Truly a Square Cat Delight! 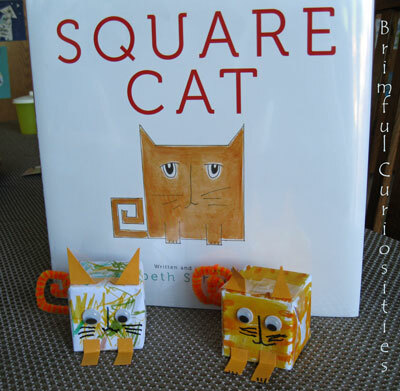 Lovely, lovely 3-D Square Cats with purrrfect Eula ears, eyes, feet, whiskers and orange pipe cleaner square tails! Purrrfect! Aladdin Books, In Stores Now! Firstly - your cats are CUTE! Secondly - I was expecting a "big square cat"... but yours are adorably small and cute... can just see how lovely they will look on the sideboard or next to your bed.. Lovely! 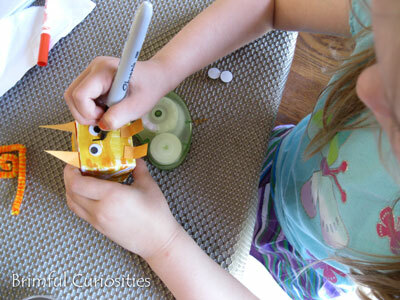 Thanks as always for linking up to Kids Get Crafty! I loved this book! The art project is great. Okay, I don't know what is cuter - the book or your 3D cats! Well, this certainly sounds and looks like a keeper! And the square cats you made? Adorable! Thanks for linking up to RAT! What an adorable project. This book sounds really cute, I will have to look for it at our library. How wonderfully simple, I love hte idea of just wrapping up the block! Super adorable! What a great idea. I couldn't love this more! Really, really cute. I love the block cats! I can't wait to read this book. My boys may be a bit to sophisticated for it, but I think I am going to love it. I love books with learning layers. Your block is super cute. This post counts as your first entry in the Summer Reading Challenge. Oh my, those little square cats are just adorable! Cute, cute, cute! I think this was such a creative idea and I love how much imaginary play it sparked after the reading and crafting. This book looks great, and I love the project!! I love this post! I'm going to look for Square Cat. I also love the craft - what a neat idea!